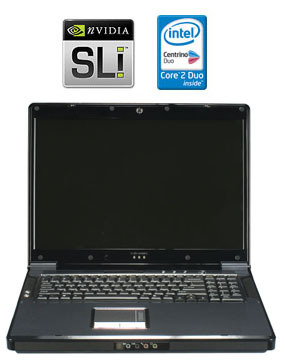 New Dual SLi Video Core 2 Duo Laptop exceeds capability of most desktops and all prior laptops. the most powerful laptop on earth. CompAmerica's (Homepage) new ORCA EXTREME laptop can do anything an extreme gaming or CAD CAM workstation can do. Hence, CompAmerica has dubbed ORCA EXTREME: "the most powerful laptop on earth." New ORCA EXTREME Laptops sport amazing new dual video adapter "as one" SLi technology based on up to twoVidia 7950GT series Video Adapters with up to 1G Video Ram. This remarkable combining of two video adapters into a single display, achieves unequaled video performance for gaming, cad cam, multimedia and graphics applications. The unit ships with a choice of Intel Core 2 Duo CPUs up to the Extreme 2.93GHz X6800, and up to 3 Mobil Hard Drives of up to 200GB each supporting Raid 0, 1 and 5. The Raid support insures that data integrity is maintained despite single drive failure. The new Core 2 Duo Extreme X6800 achieves extreme performance, and despite being a so-called "desktop Core 2 Duo" also has amazing ability to conserve energy usage. A broad range of integrated peripherals including USB 2 ports, firewire, gigabit lan, and integrated Super 108MBPS wireless 802.11 G/B and Bluetooth, deliver remarkable connectivity. As with other ORCA's, the new EXTREME offers remarkably crisp and bright video through a new "Vista Clear" 17 inch 1920 resolution Glass View LCD Screen. To round it out, a dual layer dvd burner and four speaker sound is built right in. New ORCA EXTREMEs ship with Windows XP and Windows Vista. For more information on this breakthrough laptop, Compamerica maintains a website, CompAmerica Laptop Site, as well as a product brief at Orca Extreme Page. CompAmerica is an industry leader in building advanced laptops, PCs, Digimemos and servers headquartered in New Jersey. Orca ExtremeAvailable with up to 3 hard drives, up to 2 video adapters and a standard Intel Core 2 Duo CPU.